Normally this is where’d you’d be reading insightful, interesting witty words from one of any number of our friends whose metier is writing. Not this time. We had so much fun archival material and cool photos available, thanks to our colleagues Nick Meriwether, John Conroy and Richie Pechner, that we decided to go light on words, heavy on visuals. With Volume 9, we’ve now entered our third year of the dubiously named Dave’s Picks series, although we’re not generally inclined to introspection, this feels like a good time to reflect on the series and its future. If there’s one underlying principle of these releases—and I’m not ever sure there is a formal guiding philosophy—it’s to put out good music that sounds good, period. All of the other factors that might have gone into selection previously are of less importance now, because what we’re trying to do is create a collection of full concerts that can become the building blocks of your listening life. Not every show is going to be 2/13/70, 8/27/72, or 5/8/77, but there are plenty of A+ shows remaining in the vault, so we feel (or hope, at least) that we can keep doing this for decades. As for the specific show from 5/14/74 that you hold in your hands (featuring the band’s only visit to the logistically challenging state of Montana), it’s a hot one. I learned a while back that I’m not much of a writer, particularly about music, so let’s just let the music do the talking. 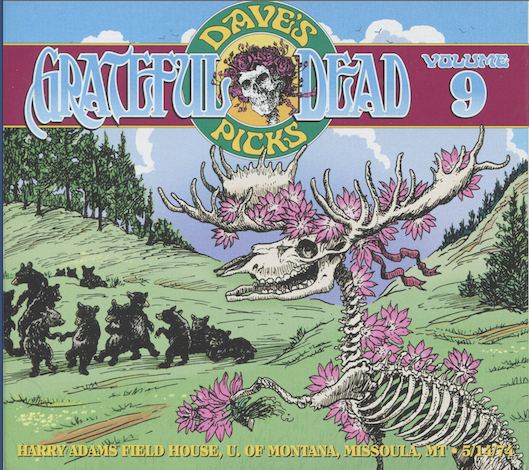 This show has plenty to love, and, as with the best concerts the Dead played, it’s filled with nuances that demand multiple listens—a show where no stuff is revealed every time you hear it. That’s part of the magic of the Grateful Dead’s music. This show, as a matter of historical triviality, was given serious consideration to be Dave’s Picks Volume I alongside 5/25/77 and 7/31/74, but was instead put aside for a couple of years, until now. We have plenty of great ideas for the rest of 2014, and 2015, and beyond. As long as you keep digging what we do, we’ll keep doing what we dig. This album was released in February 2014.